Last year's Droid RAZR paired a revelatory design with a lousy screen and lousier battery life. 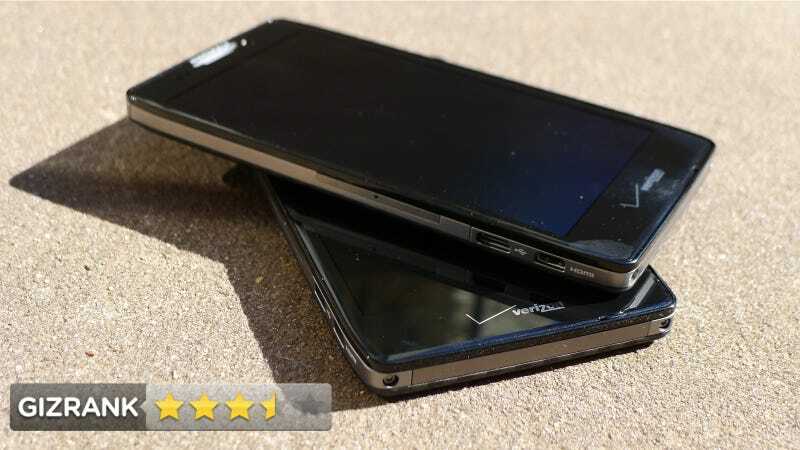 This year's updates—the Droid RAZR HD and the Droid RAZR MAXX HD—put both of those weaknesses squarely in their crosshairs. Why are we reviewing two phones at once? Because we're out of control. And because aside from the MAXX's bigger battery—and varying degrees of sticker shock—they're basically the exact same. That's a good thing. Motorola's latest flagship Android phones for Verizon. People who don't want their phones to die. Ever. They're both very rectangular, with 4.7-inch 720p screens, 8MP cameras, and laminated kevlar backplates that feel as sturdy and futuristic as they look . The RAZR HD packs a huge 2,530mAh battery, whereas the RAZR MAXX HD has an elephantine 3,300mAh. For that extra juice, the MAXX is only 0.04 inches thicker than its sibling. Some devices feel solid. These feel bullet-proof. They're powered by Qualcomm's dual-core Snapdragon S4 processor, and run a skinned version of Android 4.0 (Ice Cream Sandwich), which Moto promises will be updated to Jelly Bean by year's end. They're about as zippy as the U.S. versions of the Galaxy S III and HTC One X, which is to say they fly. Battery life on these phones will be reason enough to buy it for a lot of people. I tried—oh how I tried—to kill the battery on the MAXX HD. I tracked two hours of exercise via GPS, went on two long Navigation-led walks, all the while streaming music and leaving the screen on at full brightness. I downloaded several gigs worth of data over LTE, left Wi-Fi and Bluetooth on the entire time. I streamed a movie, played video games, did plenty of emailing and Facebooking. Come 1:30am I was down to 28-percent. Absolutely amazing. With my normal usage (which is still relatively heavy) I got through most of two days without a charge. That's how it should be, damnit! Even the regular RAZR HD got excellent battery life. It made it more than 24 hours with normal usage. The original Droid RAZR was 0.27 inches thick. The RAZR HD is 0.33 inches, and the MAXX HD is 0.37 inches. That's still thin, but I mean, it's not exactly a RAZR, is it? The only only difference between the regular and MAXX versions (aside from that battery, and nominal differences in thickness and weight) is that the MAXX has 32GB of built-in storage, and the regular version only has 16GB. Oh, there's a $100 difference in price. Both phones are splash-proof, as all gadgets should be. Moto's screens have gotten a lot better since the original Droid RAZR, and they're certainly sharper, but the color is very bad. Next to LG's Optimus G, the whites look yellowish-brown, and it's no where close to the HTC One X display's quality. There is some radio wonkiness. Sometimes, (especially after coming out of a subway) the RAZR would register that I had full bars of 4G LTE—and indicate I was connected— but no data came in or out. You have turn airplane mode on and off to kick it in gear. That shouldn't ever happen. Data speeds are rock solid. Both phones averaged upward of 19Mbps download and 13Mbps up. These phones would feel very fast had we not just tested the LG Optimus G, which uses Qualcomm's quad-core Snapdragon S4 Pro. The Optimus G simply smokes the RAZRs. The RAZRs are quite speedy, but there is subtle lag here and there. Some of this is definitely Motorola's skin, which seems to trip up the lock-screen and keyboard. That may be somewhat alleviated by the forthcoming Jelly Bean upgrade. Maybe. We hope so. Both phones have a microSD card slot, NFC, and a micro HDMI port for pushing video right to a TV. The phones also have GSM radios in them (in addition to Verizon's CDMA) which means you should be able to use them pretty much anywhere around the globe. I can't say enough good things about those kevlar backs. They're strong and smooth, but grippy. The fact that the screen went from 4.3 inches to 4.7 inches from last year but the overall size of the device didn't grow is a much-appreciated design feat. The call quality on both phones is great, and the built-in speaker is quite loud, which is an important but often over-looked feature. RAZR MAXX HD: There is only one real reason to buy this phone above others, but it's a good one: battery life. There are faster, more powerful phones out there, but none that are as fast/powerful as this can last anywhere near as long. This is the phone you should take with you on business trips or long vacations, because you'll know you can use the hell out of it and it won't die. RAZR HD: The only reason to get the RAZR HD over the MAXX is price. The differences in thickness and weight are imperceptible. You're buying either of these phone primarily for the juice, so it's worth ponying up the extra hundred for more. If you can't afford it, the RAZR HD still has great battery life, just not as great. Most importantly, both new RAZRs serve as a proof-of-concept that all other phone manufacturers should take heed of: It's possible to put a gigantic, two-day battery into a phone and still have it be nice and thin. Right now that's the exception, but these two handsets clearly show that it could be—and should be—the rule.